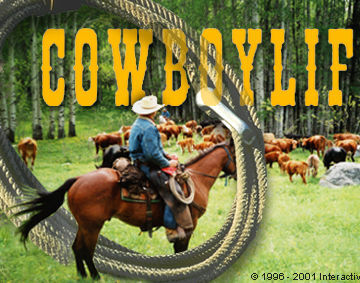 Welcome to Cowboylife, a site dedicated to Cowboys, ranching and the western lifestyle. Listen to this week's broadcast of Hugh McLennan's Spirit of the West. Access directories of Guest Ranches, Western Adventures, Horseback Riding Adventures, Cattle Drives, Western Events, Cowboy Poetry, Books and Cowboy Art & Gifts. If you enjoy cowboys, ranching and the western lifestyle, come often and enjoy the Cowboylife! Dedicated to Ranchers, Cowboys and everyone who enjoys the Western Lifestyle.